Crewe Alexandra have signed two Championship loan strikers before the close of the emergency loan window. 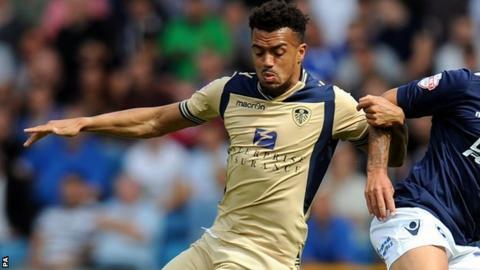 The League One bottom club have signed Leeds United's Nicky Ajose, 23, on a deal lasting 40 days until 5 January. Crewe have also brought back Uche Ikpeazu, 19, on a two-month loan from Watford until 25 January. Ikpeazu proved a success when he spent the second half of last season on loan at Gresty Road, scoring four times in 15 appearances to help Crewe stay up. The first of this season's emergency loan windows closes at 17:00 GMT on Thursday, 27 November. He returns to join an Alex side who prop up the rest of the division following a winless six-match run under manager Steve Davis, in which they have scored just two goals. Former Manchester United trainee Ajose was signed by Dave Hockaday for Leeds from Peterborough United this summer on a three-year deal for a reported £150,000 fee. But, having scored a combined 17 goals for Swindon Town, where he spent the first half of the season on loan, and Peterborough United last term, he has not featured this time round since Hockaday's early-season sacking at Elland Road.